I came across quilling when I was searching through the different craft supplies listed on ebay. The quilling patterns fascinated me and I decided to try my hands on paper quilling. For me quilling was a new art form of cardmaking, but if you research a little, you will find that quilling has been around since Renaissance. Quilling is the art of making rolls of thin paper strips and then making beautiful designs. I made a quilled birthday card for my brother-in law last year when I was in Edinburgh. Unfortunately I didn't save snap of that quilled card. That was my only quilling creation. 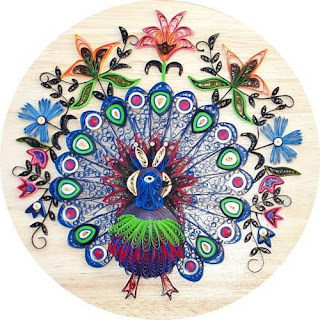 I bought many quilling papers, and quilling kits on ebay because we had to move back to India and there you can't get quilling supplies easily. Regrettably, I don't have any quilling tools with me now, every thing is stored in the craft box up in the attic. The peacock is very nicely done! Do you know who made it? thanks for dropping by Ann, I am really happy that you came to visit. I am a huge fan of yours. The peacock in question won an award at Quilling Guild's Exhibition in 2000. I have linked the picture to the site where I found it.